We are delighted to announce the release of our next Definitive Edition CD. 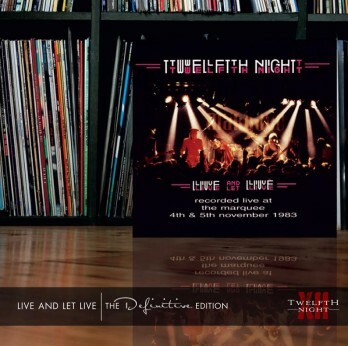 Live and Let Live comprising the entire set (of 15 songs) from Geoff’s farewell gigs at the Marquee in November 1983, will be released at the end of September, but can be pre-ordered now. The double CD set includes a number of unreleased, remixed and remastered performances, reconstructing the entire set from the best available sources. Everything has been tweaked and balanced for re-release by Karl Groom (house producer at Thin Ice studios, and all-round good guy) – and it sounds really great..! Well we would say that, wouldn’t we..? There is also a 24-page booklet with the lyrics from all the songs (illustrated with many previously unseen photos), new sleevenotes from Brian Devoil and Andrew Wild, all lovingly put together by the master designer Paul Tippett. It’s the most lavish booklet we have done to date – and Dave Robinson from F2 / Festival Music says he thinks it’s the best one yet! You can pre-order Live and let Live today for just £12 (plus postage) from our online shop. Finally we would just like to say a very big ‘Thank You’ to Andy Wild, Mark Hughes, Dave Robinson, and Paul Tippett for all their help and hard work in putting this album together. Thanks guys! Following the hugely successful gig at The Peel at the beginning of the year, we have lined up 3 more Cryptic Clues gigs this Autumn. And in case you have forgotten… the Cryptic Clues are Brian Devoil, Clive Mitten, Andy Revell and Mark Spencer, playing classic 1981-1983 era Twelfth Night. And finally, we shall be performing as “special guests” at DanFest 2, being held at The Musician, in Leicester as part of a two-day festival. We will be playing a full set around 8pm, on Saturday 24 November, being followed on stage by our friends Galahad. There is a late bar, we’re told..! Tickets are available from the venue and www.wegottickets.com priced at £35 for the weekend. Day tickers are £22 for the Saturday and £15 for the Friday. Other bands appearing over the 2 days include Magenta, Also Eden, Landmarq and Credo. Those of you who follow Clive on Facebook will know that he has recently announced that these three gigs will be his last ones. He says the struggle to combine work/life/family commitments with everything that is involved in live performance has become very difficult, and that although the reunion has been great fun he thinks his future music making will be mainly writing and recording with his home set up. With Andy Revell indicating that he feels similarly to Clive, and Mark Spencer having other gigging commitments and (musical) projects next year, it seems that these forthcoming Cryptic Clues gigs will be the last ones. So please come along and give us a big send-off. Our song Blue Powder Monkey has been included on a new compilation: Prog Rocks Vol. 2.